I hope you all had a wonderful Easter this year! I spent the day at my Grandma's house with family, the usual scene every holiday. I love any opportunity to get dressed up! 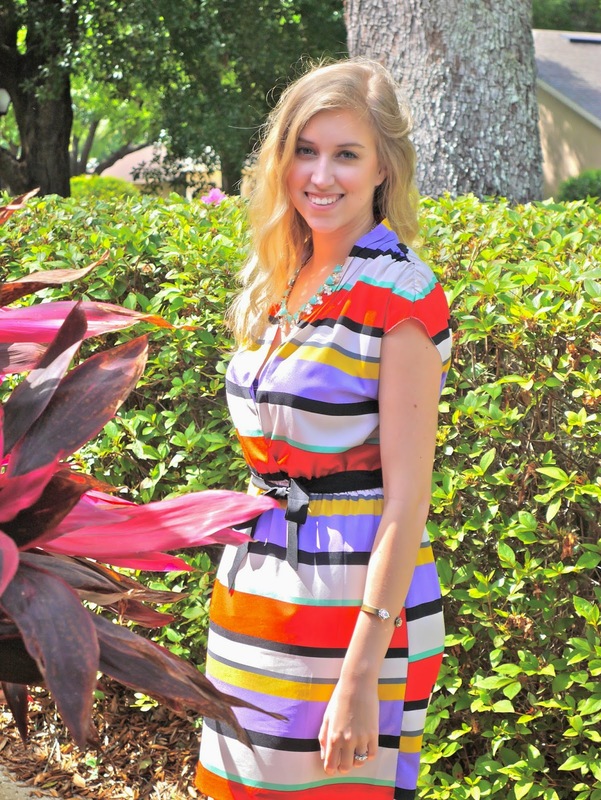 I wore this Gianni Bini dress because of the bright, springy colors and bold stripes that kind of reminded me of an easter egg! My shoes are strappy mint sandals, I believe they are from DSW but I've had them for a while. This entire outfit came to be because of this gorgeous necklace from my latest Rocksbox! As soon as I saw it I knew it would be perfect for Easter. If you would like to try Rocksbox, you can get your first month free with code sugarspicesparklexoxo. Trust me when I tell you - you will NOT regret it! I love this service so much, I get to wear so much beautiful jewelry because of it, I never have to wear the same thing twice! My bracelet is also from Rocksbox! Yes they send you Loren Hope!! Now you really want to give it a try, right? ;) This bracelet is the perfect pop of sparkle that goes with absolutely everything.